The geriatric health care climate has changed drastically over the past two to four decades. Elderly – those over 65 – were once a group with severe disease, hindrances, and overall health decline. However, thanks to the massive improvements in our healthcare system in the last century, those reaching the elderly years now are beginning to experience a greater sense of health and wellbeing that lasts long into their aging years. This shift in health care for the elderly has directly affected the world of dental care as well. While the playing field has changed, the conceptions about those on the field are still stuck in the 1970’s. As a geriatric dentist today, one sees a variety of incorrect beliefs concerning elderly dental and oral health. Becoming edentulous (without teeth) was once considered a normal part of aging, and many in the healthcare world still carry that belief. However, statistics show that the percentage of edentulous elderly has steadily decreased in the past few decades. As recently as 1971, about 50% of Americans over the age of 65 were edentulous. But a collection of data from 1998-2004 showed that only 23% of Americans age 65-74 were edentulous. In a 1994 study, those in this age group with teeth averaged 19 existing teeth. While those above age 75 still averaged 16 teeth. By 2006, the figure was over 18 remaining teeth for those over age 75. Dental professionals believing that the elderly will inevitably lose their teeth, don’t care to keep their teeth, and can do nothing about it anyways, will miss out on an opportunity to present preventative and restorative dental services to a group that desperately needs it. While the elderly certainly need more strategic care, it is important for a geriatric dentist to understand that not all signs of aging oral health should be treated as though it is severe periodontal disease. Today, geriatric dentistry issues should be treated with more preventative measures in mind. In a National Health and Nutrition Survey, results showed a cessation or, at the least, leveling off within the elderly surveyed of the two most common signs of severe periodontal disease – bleeding upon probing and increased pocket depth. However, the survey did return an indication of subgingival calculus, recession, and loss of attachment. These findings affect the method of treatment for the elderly quite significantly. The absence of severe pocket depth and the presence of calculus determines that much of the dental treatment for this age necessitates non-surgical procedures, such as scaling and localized root planing. The increased interproximal space (area between the tooth and gums) determines that extra oral hygiene measures should be taken for treating bacteria and plaque within these difficult areas. A highly common condition among elderly patients is root caries. These dictate a necessity for greater preventive measures within daily and periodical dental routines. Salivary flow acts as the body’s natural method for cleansing teeth and remineralizing surfaces after damage has been done. Saliva neutralizes acid within the mouth. However, when salivary flow is low, acid takes a toll on the strength of the tooth’s enamel. While dry mouth is common in the elderly, it is not a direct result of old age. Most often it results from a medication being taken for a current condition or disease. Thankfully, this can be corrected. A geriatric dentist that does not buy into the myth that a dry mouth is only due to old age, will be vigilant to spot this issue and seek rectification for patients. 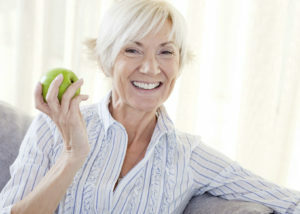 Geriatric dental care no longer consists primarily of extensive surgeries and simply creating and maintaining dentures. It holds a much more similar appearance to the common preventative measures that are acceptable all through childhood and the adult years. Geriatric dentists that wish to offer exceptional care for their patients must throw out the common beliefs of elderly dental care that stem from decades ago. 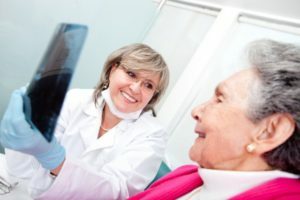 Today’s generation of dentate elderly are seeking dentists that will listen to their dental concerns and understand the unique challenges they face while fighting to keep their natural teeth in healthy order. Homebound dental services has quickly become one of the most unmet areas of need within geriatric healthcare. Because of the increase in life expectancy due to various medical advances, the healthcare world has seen an increase in the need to identify and effectively service unique geriatric health needs. One of the greatest areas of need, geriatric dental care, has resulted in a movement of homebound geriatric dentists providing service for the immobile elderly. While there still exists a large gap between the amount of elderly that need homebound dental care and the healthcare workforce available to provide it, Dr. Alisa Kauffman of Geriatric House Call Dentistry has been making a difference in the lives of elderly patients for over 30 years. As a homebound geriatric dentist that works right within the Manhattan area, Dr. Kauffman has experienced many challenges through the years and has a vast foundation of expertise and compassion for those she treats. An open door policy – While Dr. Kauffman doesn’t have an office building with an actual “open door”, she places great importance on being readily available for her patients and patients’ family members. Her direct phone number is always available and she strives to answer whenever possible or return the call quickly. Open communication – Dr. Kauffman knows that geriatric dentistry for the homebound presents many unique situations. She understands that your loved one may have challenges and needs that must be individually met and considered before any treatment is given. Open communication concerning questions and concerns is valued and encouraged. Friendly smile – With a heart for the elderly and a love for dentistry, Dr. Kauffman comes ready with a smile and a skillful hand. She instantly brings calm and comfort to her patients. Top-Quality standards – Even though her practice is done in home, her standards for cleanliness and sanitation are never compromised. Disposable, plastic utensils are used when possible and others are sterilized in an autoclave before use. Behavioral expertise – Many of Dr. Kauffman’s patients suffer from dementia, making normal medical exams highly difficult. Dr. Kauffman shows skill and patience as she handles difficult behavioral issues with ease. Of the homebound geriatric dentists available in New York City, Dr. Alisa Kauffman’s service is incomparable! To benefit from Geriatric House Call Dentistry call us today at (917) 826-6278 or contact us online.